From the corner office to the Oval Office, cleaning up messes is all too often left as women’s work. 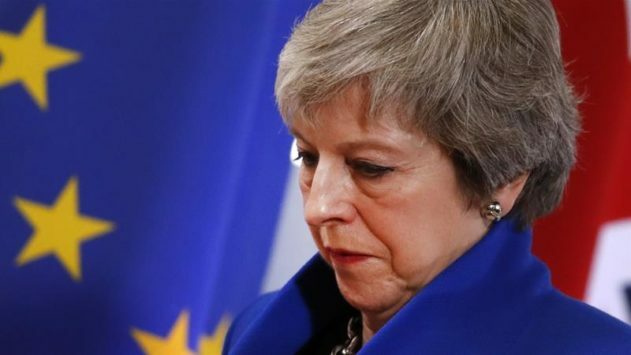 The second woman to occupy 10 Downing Street offered to step down if Parliament passed her latest Brexit plan. Though lawmakers rejected it, Theresa May’s apparent “sweetener” marks the latest instance of female executives rising to power in times of crisis only to shoulder the blame for that crisis itself. The pattern is all too clear. In the corporate world, a few select high-profile women have cracked their way into the top office – still holding at 5% of Fortune 500 CEOs. The instances of these successes also read as a cautionary tale of women as scapegoats. Mary Barra, Meg Whitman, and Carly Fiorina have all seen stellar careers tarnished by their tenures during market downturns. Just six months ago JC Penney announced with great fanfare that it was bringing on its first female CEO, 30-year industry veteran Jill Soltau, tossing her into that company’s precipitous slide of profit losses and store closings. The phenomenon has been called the “glass cliff” — where women are promoted during a rocky time for a company, setting them up for failure. These women might not expect that smashing through the glass ceiling might end with them getting torn to shreds by the falling shards. Below the CEO level, the paradigm holds. The office of Chief Compliance Officer, a growing sector of corporate management, is a post that shows an alarming trend of “glass-cliff-ism.” After a violation, many companies are turning to women to deal with the remediation that follows, including in some cases implementing a previously lacking compliance policy, and, maybe even more difficult, instilling a culture of compliance. The example that’s shaping up in the political world is perhaps even more harrowing. The record-shattering number of new female members of congress have become quite conspicuously ubiquitous in political media. Congresswoman Alexandria Ocasio-Cortez has seen her name slashed to three initials at the presumed behest of headline writers across the country. She and her fellow newcomers bear a significant risk of becoming the feminine face of longstanding legislative gridlock, and carry the burden of upending a stereotype that women are the nurturers and the fixers, not the fighters. This is not to say women must act like men to survive a man’s world – Tina Brown has a point when she observed recently that for “thousands of years of civilization, women have evolved to deal with the intractable perplexities of life and find means of peaceful coexistence where men have traditionally found roads to conflict.” We don’t need to eschew the traits so glaringly lacking in some men that some women have; we should embrace those qualities, but we should not expect that all females leaders have them. The stakes only rise when we glance down Pennsylvania Avenue. A remarkable number of women are vying to become this nation’s first female president. They represent a great variety of talents and qualifications and just four years after Hillary Rodham Clinton’s history-making run, and while we already see gender affecting coverage of their “likeability” as it has for female leaders for some time (see a recent New York Times Op-ed headline: “The Unloveable Theresa May”), gender hasn’t emerged as a defining characteristic of any candidate so far. But the peril is there. Whoever follows the current president into the Oval Office will confront significant challenges on multiple fronts. The U.S. posted its largest monthly budget deficit on record in February and talk among economists of a coming recession is on the rise. The 72-year-old current president is said to be unconcerned about the long-term effects of his economic policies, reportedly dismissing the importance of anything that happens after he leaves office. A responsible tenure for any new administration will likely have to begin with fiscal pain, as well as require mending our relationships with many allies and walking back a myriad of careless and insulting tweets. Rebecca Hughes Parker is the Global Editor-in-Chief of the Anti-Corruption Report and the Cybersecurity Report, business-focused subscription legal products. Previously, she was a litigator, amassing significant trial, appellate and internal investigation experience. Opinions expressed herein are her own.